Commercial Building EMS, Do You Have One In Place? Every building can improve its energy performance and run efficiently. Within a commercial building there are several key components that affect energy consumption and equipment functionality. An Energy Management System (EMS) plays a major role in managing these components and maximizing the overall performance of the building. An EMS monitors, controls and provides data regarding energy usage in a building. Implementing an EMS reduces operating costs, lowers carbon emissions and can result in an energy savings up to 40% if used properly. An EMS integrates all building systems to work as one systemized unit. This system is important to the daily operation of your building as well as alerting you to failures and problems. 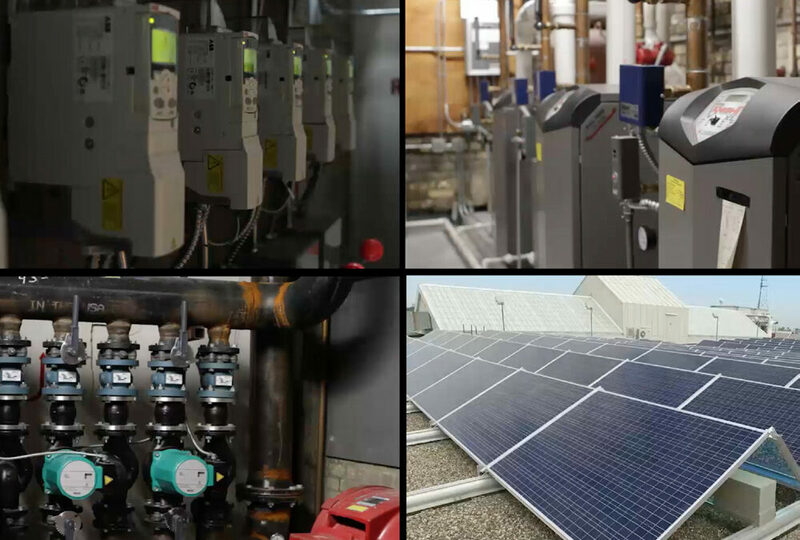 Max Currie, Principal and Chief Engineer at Suntide Commercial Realty, Inc., a commercial property management and construction company, implements and monitors energy management systems in all buildings Suntide manages and owns throughout the Twin Cities. He recommends four main areas to concentrate on to receive substantial savings. Interior and exterior building lights should be connected to your EMS. Lighting a building is a large expense for owners and eliminating off hour lighting is imperative to cost savings. Sensors and meters can control the schedule of days and times lights are to be in use in high traffic areas as well as non-occupied spaces. Max recommends adding daylight harvesting sensors to reduce peak demand charges. Implementation of an EMS can yield increase savings to your HVAC equipment. By scheduling operation times, you reduce the buildings load allowing your system to operate more efficiently. Setting zones to turn off exhaust fans when not needed and controlling the temperature of spaces at night increases the longevity of your equipment as well as saving energy. A good rule of thumb is tying the EMS to the Variable Frequency Drive to yield further savings. Significant reductions in water use can be made by implementing simple changes. Be sure to install water-efficient fixtures in restrooms, showers and kitchens. Landscaping designs should incorporate fixtures and techniques minimizing water loss. The EMS will monitor these fixtures and the EMS data will present areas of improvement and cost saving. For example, if your data indicates you have high water usage over a holiday when water consumption is expected to be lower, this would indicate a possible water leak. Monitoring your building’s power usage is another way to improve energy efficiency. The EMS will collect and monitor data for all energy outputs. This allows you the ability to analyze the consumption and identify areas of concerns or waste. For example, if a system was manually set for 24 hour use it would be reflected in the energy used. Demand limiting strategies can be added for even more savings. The more building systems connected to the EMS the better your ability to interpret the efficiency of the building and make decisions to administer adjustments for optimal performance. The EMS will report detailed energy consumption data making it possible to see patterns of energy waste and to trace your progress to make ongoing energy savings. There are also several other energy outputs that should be monitored by the EMS. Suntide Commercial Realty can guide you through the process and maintain your building to achieve top performance. Suntide achieved awards for the top 2 buildings over 100,000 SF in the city of Minneapolis with the lowest energy consumption and the largest rooftop solar array in the city of St. Paul. Suntide has reduced energy by 40% in three of the largest properties under their management, each earning the energy star rating. You too can achieve these results. Connect with us to learn how www.suntide.com.